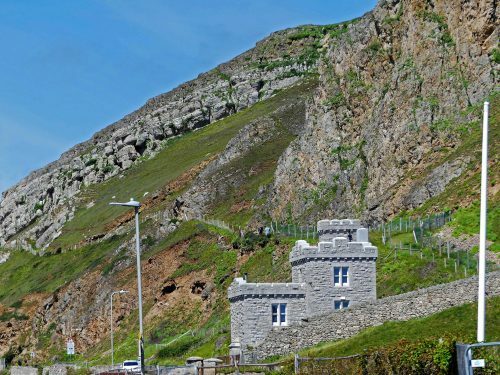 The great bulk of the west face of the Great Orme rises steeply from the shore of the Irish Sea; its scarred and fissured face testament to centuries of the relentless onslaught of invading weather fronts. Glancing upwards from its base it looks intimidating, barren save for a few patches of eroded grass and seemingly hostile as habitat for anything save the odd nimble Kashmiri goat. However, as in the best tradition of myths, legends and fairystories, looks can be deceptive and here-upon, not too far away, lies a magical kingdom populated by tiny beautiful creatures. The creatures take the form of butterflies. Two diverse species have evolved and adapted themselves to survival in this unlikely place and have been recognised and classified as ‘sub-species’. Both are ‘dwarf races’ and considered to be endemic to the site. 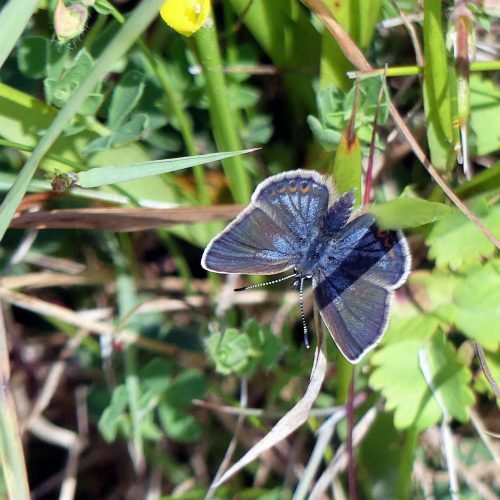 One is a variant of the rare Silver-studded Blue, classified as Plejebus argus ssp. 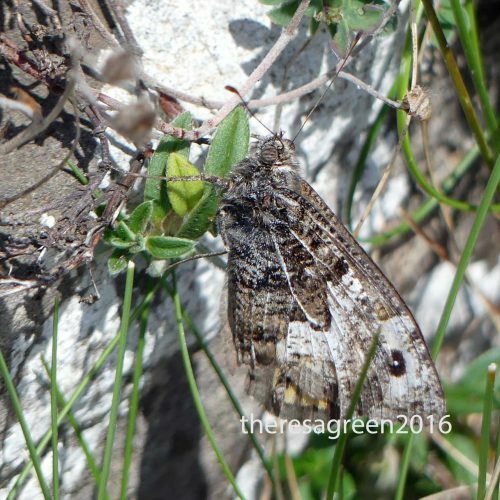 Caernensis and the other a variant of Hipparchia semele (Grayling), classified as (ssp.Thyone). The day was sunny but windy, conditions which bring out the butterflies but often keeps them low to the ground or amongst long grass stems. 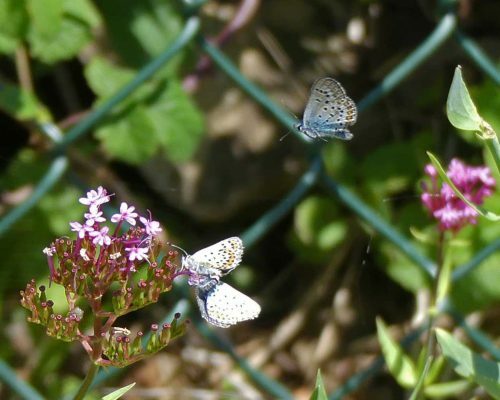 I wasn’t expecting to start seeing the little Silver-studded Blues as easily as I did, but there on a patch of red valerian below the ‘dangerous cliffs’ sign I spotted my first ones. Most were looking rather worn and a bit tatty, but I was happy to see them at all. As I watched I spotted a pair coupled together who were then joined by two others with another fresher-looking male also heading their way. Unlike their cousins, the Common Blues, these smaller butterflies don’t zoom away at speed just as you’re about to press the shutter button, but flutter gently from place to place, tending not to fly any distance away. They seem to bask quite frequently. The Silver-studded Blue gets its name from the light blue reflective scales found on the underside of most adults and which are quite visible when light reflects off them. The uppersides of males are a glorious blue with a dark border. Females’ uppersides are browner with a row of orange spots; in this sub-species they also have a variable flush of blue that extends over the hindwings and the base of the forewings. Undersides are brown-grey with black spots, a row of orange spots, and small greenish flecks on the outer margin. 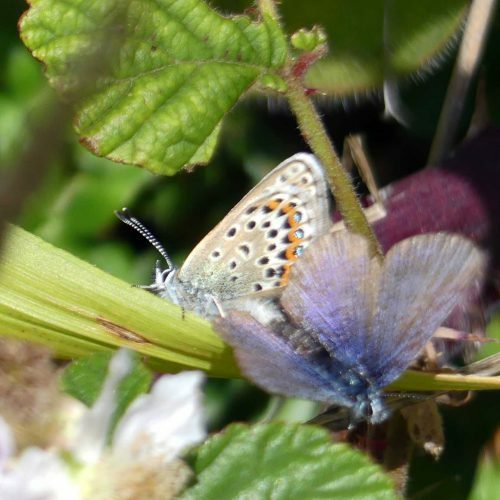 Males are similar to the Common Blue, which lacks greenish spots. The Silver-studded Blue is a Priority BAP (Biodiversity Action Plan) species. Generally they are found in close-knit colonies, most containing less than a thousand adults. 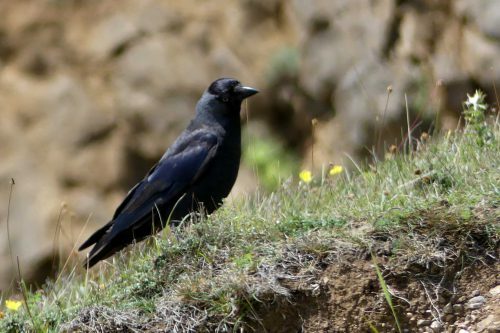 Here on the Orme numbers fluctuate but may rise to a thousand or more. Today I met a warden and an assistant on the path that were assessing current numbers – in one spot alone they had counted 130 individuals, so despite the recent inclement weather, they appear to be doing OK. The number of Graylings I saw also took me by surprise as in other locations I’ve been delighted to come across the occasional one; along this path I encountered a good few patrolling the path. I’m always hesitant to give a number as I have no idea how many times I might have seen the same one as it circumnavigated a territory. H. semele ssp. 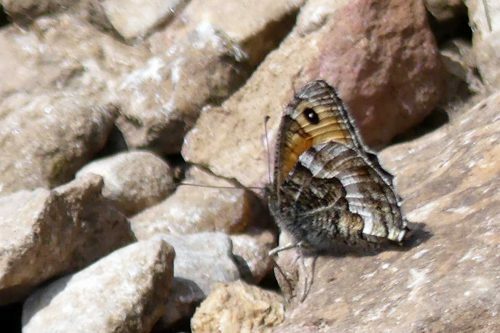 Thyone flies earlier than is usual with other races of Grayling, being on the wing towards the third week in June, and disappearing by the end of July. ♂ Strikingly smaller than any other British race of semele. Coloration is more uniform than in typical semele, with the pale areas more ochreous. Forewing spots are smaller than in other races, with the lower of the two frequently absent. Underside coloration duller and less contrasting than in the type, with the white areas of hindwings tinged with ochre. ♀ Also smaller than other races. Spots are smaller than in normal specimens. The special butterflies were not alone here. In a small sheltered quarried out area at the side of the track more red valerian was attracting some larger visitors. I was most thrilled to see a Small Tortoishell, only the second I’ve seen this year and the first to stay put long enough to photograph. There was a Red Admiral there too, a few Meadow Browns and a single Dark Green Fritillary that was repeatedly chased away by Graylings. 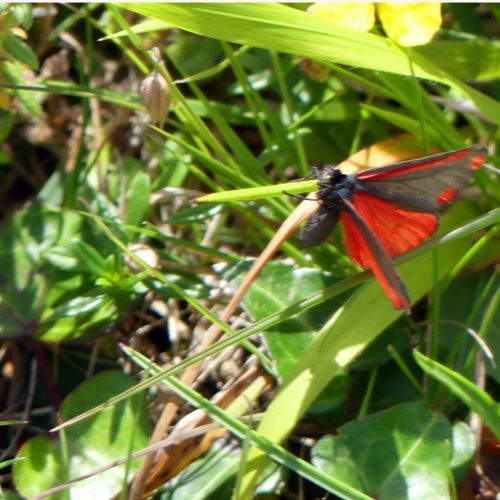 Another first sighting for this year was a Cinnabar Moth. I was musing just the other day about why I rarely see the adult moths when the distinctive yellow and black caterpillars are so numerous at this time of year; perhaps they don’t over-winter well? It was tricky to get even this less-than-brilliant image as the poor thing was fighting against the wind trying to stay on the cliff edge.